Halloween is always a spooky time, but this year there is added tension with the Mayan prediction hnaging over us. They've suggested the world is going to come to an end towards the end of 2012, and that time is inching ever closer . 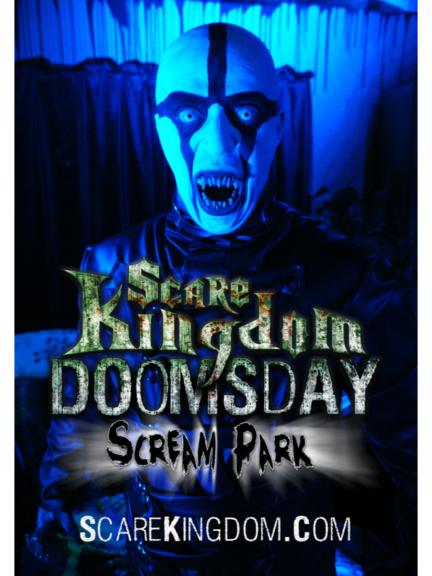 . . And, for those in Bolton, Blackburn, and the surrounding areas, Hell on Earth is going to be unleashed as the Scare Kingdom Doomsday Scream Parkre-opens on the 13th October for the fourth consecutive year. This year, Doomsday spells terror, horror and gruesome gore like never before! Gone are the storytelling attractions from earlier years, as in 2012, Scare Kingdom ramps up the fright factor with full on fear. There are four brand new scare attractions plus a range of new scare frights, as this year’s scare entertainment park is set to be the most frightening ever. Running over 15 dates between Saturday, October 13, 2012, and Saturday, November 3, 2012, inclusive, this year's scream park will operate on more nights than ever before, following the huge demand from scare-seekers who travel from all over the UK to visit the park. These are the very same guests that asked for more scares - and this year they will get them in a 'no holds barred' line-up of attractions targeted at thrill-seekers, families and brave children! It's going to be a fantastic event, scary, sure, but fantastic nevertheless. And definitely not one to be missed. Tickets are available via the website at www.scarekingdom.com or via Ticketweb on 08444 77 1000 from May 2012, and range from £15.00 - £17.50 per body per night.